Ford said it will invest $40 million on employee-focused improvements, including new LED lights, a better cafeteria, new break areas and parking lot security guards. Ford Motor Co. said it would add 500 jobs at its Chicago Assembly and Chicago Stamping plants as part of a $1 billion investment to accommodate production of the redesigned Explorer and Police Interceptor and the new Lincoln Aviator crossover. The plants will be retooled for added capacity beginning next month for the 2020 model-year vehicles. Planned upgrades include a new body and paint shop, as well as new stamping lines, Ford said in a statement Thursday. Hinrichs announced the investment and new jobs at the Chicago Auto Show with Chicago Mayor Rahm Emanuel. The additional 500 full-time jobs will bring total employment at the two plants to approximately 5,800, Ford said. The investment is in line with what Ford agreed to invest there as part of its last contract with the UAW. The deal included promises to pour $900 million into Chicago Assembly and $200 million into Chicago Stamping over the course of the four-year pact. The additional jobs come as Ford continues to shuffle its U.S. work force to focus production on high-margin utilities and pickups. 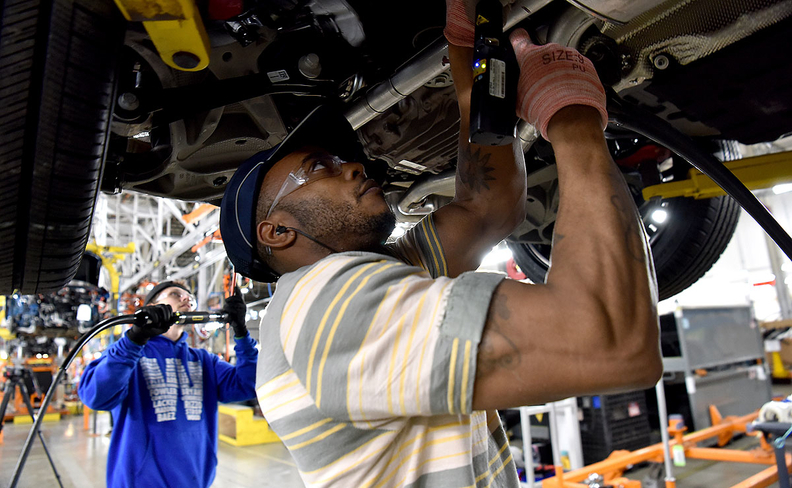 Also this spring, Ford's plant in Flat Rock, Mich., which makes the Mustang and Lincoln Continental southwest of Detroit, will go from two daily shifts to one. Most of those workers can transfer to the Livonia Transmission Plant, which will gain roughly 500 jobs, about 30 miles away. Another 150 workers will move from Flat Rock to other Ford facilities. Ford said last year the moves will allow it to increase production of its profitable Expedition and Lincoln Navigator SUVs by 20 percent at Kentucky Truck. After announcing last year it planned to discontinue its sedans, Ford plans to shift 90 percent of its capital allocation into utility and pickup production in the coming years. Ford is counting on the sixth-generation Explorer and new Aviator nameplate, both due later this year, to help drive sales. The 2020 model year vehicles were designed on a new rear-wheel-drive, unibody platform that engineers say helps handling and performance. Ford will offer a hybrid and ST-badged performance variant of the Explorer, as well as a plug-in hybrid Aviator Grand Touring model. The automaker will also build the Explorer-based Police Interceptor at the plant. Lincoln executives say the Aviator could become the brand's top-selling nameplate. Meanwhile, the Explorer's redesign could help push it over the 300,000 sales mark for the first time since 2004. CEO Jim Hackett called the vehicle Ford's "heart and soul." Chicago Assembly, opened in 1924, is Ford's oldest continually operating plant. The nearby stamping plant opened in 1956. The operations attracted unwanted attention in late 2017, when The New York Times published an in-depth report detailing what workers said was widespread sexual harassment at the assembly and stamping plants. After the report, Hackett visited the plant to underscore his zero-tolerance policy on sexual harassment.